Great British Bake Off is back and my Wednesday night viewing is sorted for the next few weeks. This year the competition is going back-to-basics and whilst the challenges set may be easier, judges Mary Berry and Paul Hollywood have said that they are going to judge the bakes to the highest standards ever. I have been a huge fan of the programme ever since it first came on our screens in 2010, finding it a rich source of baking inspiration. After watching the first episode, I’m delighted that this year looks as good as ever. In the opening challenge the contestants were tasked with making their version of a drizzle cake. Amongst the various offerings was a Gin & Tonic Drizzle Cake but unfortunately the judges weren’t too keen on it as its baker Tom was a little heavy-handed with the alcohol. Here is my interpretation of that cake but flavoured with a syrup made with gin so that most of the alcohol burns off but the flavours remain. 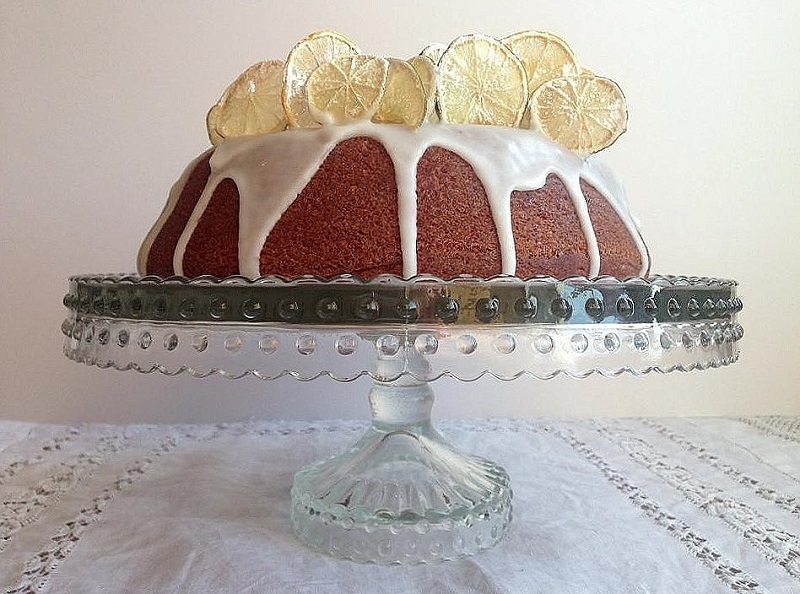 I have baked the cake in a plain bundt tin but a 900g (2lb) tin will also work and I have topped the cake with citrus crisps made from thinly sliced lemons and limes. 1. Preheat oven to 80C/Fan Oven 60C/Gas Mark ¼. Place the lemon and lime slices spaced apart onto a silicon mat. 2. Bake in the oven for 30 minutes. 3. Remove from the oven. Turn the slices over and dust with icing sugar. 4. Return to the oven for a further 20-30 minutes until crisp but don’t allow to brown too much. 5. Dust with more icing sugar and allow to cool. The crisps can be made in advance and stored in an air-tight container. 1. Preheat the oven to 170C/Fan Oven 150C/Gas Mark 3. Grease a plain 23cm bundt tin with butter and dust with self-raising flour – shaking out any excess – and set aside. 2. Place the butter and caster sugar into a large mixing bowl and cream together using a hand-held electric mixer until light and fluffy. Gradually add in the milk, mixing well after each addition. 3. Add the sifted flour and fold in along with the finely grated citrus zests. Finally mix in the tonic water to create a soft batter. 4. Pour the batter into the prepared cake tin, smoothing out the surface a little and bake in the preheated oven for 35-40 minutes or until a thin skewer inserted into the centre comes out clean. 5. Remove from the oven and allow to cool in the tin for 10 minutes before turning out onto a wire rack to continue cooling. 1. Place all the ingredients for the syrup in a small saucepan over a low heat. Stir until the sugar has dissolved and then increase the heat to high. Simmer for 8-10 minutes until reduced by a half. Remove from the heat and set aside for a few minutes. 2. Meanwhile, using a thin skewer, poke holes all over the top of the still-warm cake and then carefully spoon over the syrup allowing into soak into the cake. Allow to cool completely. 1. Mix the icing sugar and gin together in a small bowl to achieve a pouring consistency. Spoon this over the cake, letting it drizzle down the edges of the cake. Let the icing set a little and then decorate the top of the cake with the citrus crisps.